USPA NEWS - Spain celebrates forty years of democratic constitution on Thursday. Approved by Parliament on October 31, ratified in a referendum on December 6 and in force since December 29, 1978, the Spanish Constitution comes to this anniversary wrapped in a heated debate on the need to reform it. Far is the majority of the 87.78% that approved the rule in referendum: today, the left parties with parliamentary representation press to repeal some precepts and modify others. The Spanish Constitution of 1978 was reformed twice, to allow any citizen of the European Union to vote and be elected in a national election, and to limit public spending. Both reforms, inspired by the European Union. But now the debate is centered on the model of State that is intended and on the role of the Crown in the new society of the 21st Century. The nationalist parties want to change the unity of Spain by a federal model in which some regions acquire the international status of a state, and the republican parties want to end the inviolability of the King as the first step to end the monarchy. 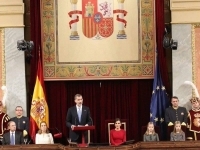 This Thursday, at the Congress of Deputies in Madrid, chaired by King Felipe VI and Letizia, with the assistance of the Princess of Asturias, Infanta Sofia, the emeritus King Juan Carlos and Queen Sofia, the former prime ministers alive, the speakers of the Constitution alive, the Government, deputies and senators, the King recalled that "the Constitution is the great national covenant of coexistence" among the Spanish. Previously, the president of the Congress, Ana Pastor, stressed that "this is the time to renew that agreement." Pastor emphasized the will of consensus that guided the parties in 1978 and affirmed that "we have been successful in choosing the path of agreement." The Constitution, said the president of the Congress, "has been a success story. 40 years ago it was about overcoming a long dictatorship and being a democratic nation fully integrated into the Europe of freedom. And if we do it then, how can we not get it now too? ", she asked. In relation to a hypothetical reform, Ana Pastor said: "The Constitution has been the framework in which our coexistence has developed. [...] It has never been a lock. Like all human work, it is perfectible and allows reforms." But she appealed to the consensus and not to take shortcuts in this matter, and recalled the words of one of the rapporteurs of the Constitution, who said that "no Constitution should be reformed with less agreement than the one that approved it." For his part, King Felipe VI noted that "this anniversary is a great opportunity to remember and recognize the historical dimension of the decision made by the Spanish on December 6, 1978, and it is also, no doubt, to assess in our days its scope and projection as it deserves." The monarch added: "Now that 40 years have passed, we can say that, in fact, under the validity of our Constitution, Spain has undoubtedly experienced the deepest and most radical political, territorial, international, economic and social change in its history. In the political sphere, today - above all and happily - we can affirm that democracy is firmly and fully consolidated, young generations are born, educated and developed in a democratic society and constitutional values permeate the daily and personal life of our citizens and also our collective life." The act of homage to the Spanish Constitution of 1978 was also attended by twelve regional presidents, but not those of Catalonia, Navarre and the Basque Country. Prime Minister Pedro Sanchez was booed by the public waiting around the Congress. 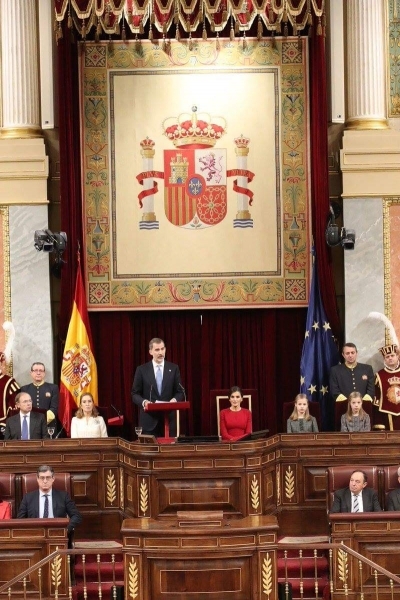 Communist leaders and the formation of the extreme left Podemos not applaud the national anthem, played when the Kings made their entry into Congress.